Well… it’s so hard to believe! But, August is here, which means that school will be starting soon for so many kids across the country. With school starting, everyone’s schedules get turned upside down, our routines get thrown out the window, and we have to go back to the drawing board to create a new schedule for the whole family. In this whole shuffle, it is often easy to forget about nutrition and good eating habits, especially at school. That is why it is super important to encourage healthy habits at home, that your children can take with them when they go to school. The most important thing to remind children of is to monitor the amount of water they are consuming. When school starts, it is usually still very hot outside. Plus, many back-to-school activities are held outside. So, it is important that your kids remain hydrated. Make it a game! Discuss with your kids how many bottles of water they should drink while at school. ( 24-32 oz. is a great goal) If you think it may be easier, you can also just remind them to stop by the water fountain during every break and take a big drink. They may not know exactly how much they are drinking. But, it gives them a good goal to reach for. Have them keep track throughout the day and report back to you when they get home. Of course it is on their honor, but you could even have a reward established for reaching, and exceeding the goal. Another important aspect of good nutrition when returning to school is the foods that your children consume during lunch. 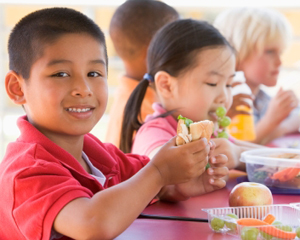 Unfortunately, many school lunch programs offer a lot of foods that your child does not need to be consuming. This food packs in the calories and oftentimes provides no nutritional value, leaving your child’s body needing more. When their bodies aren’t getting the fuel they need, they will not learn as well and will struggle to pay attention in class. This is why it is so important that your children eat foods from each food group to remain fueled and focused. The bottom line is that you have been monitoring your children’s nutritional habits all summer; many times without even having to give it much thought. So, now that they are back at school, it is easy to just assume their nutritional needs are taken care of. However, that isn’t always the case. Parents need to be involved in teaching children how to make positive, healthy choices. Need some help? NCES has developed two great new handouts geared towards helping Tots (ages 2-6) and Kids (ages 6-12) make healthy choices, all based on the USDA’s new MyPlate. If you have any questions about them, be sure to contact us through Facebook, Twitter, email or phone.